LG Mobile Support Tool is a tool you must install on your PC in order update your LG mobile phone to the latest software. Updating the firmware on your mobile device ensures a better and faster performance for your phone. LG Mobile Support Tool Free Download Latest Version For Windows OS (XP-7-8 and 10). Get the offline installer standalone setup file of LG Mobile Support Tool with a single, direct and secure link. The downloaded setup file is compatible with both Windows 32 and 64-bit versions. LG Mobile Support Tool is a free software designed for LG mobile owners, it checks for new versions and updates the firmware on all LG devices connected to Windows PC. As we all know, installing the latest updates on your LG mobile phone makes it not only faster but also more stable. After a new firmware version is detected, LG Mobile Support Tool will download it and upgrades the firmware on the device. Having the latest firmware is critical for the speed and performance of your phone. To start the LG Mobile firmware update using this application, you will need to connect to high-speed internet and a USB cable to connect your LG phone to the Windows PC. This process allows you to download the latest updates directly on your LG mobile. This tool is easy to handle and features an attractive user interface. 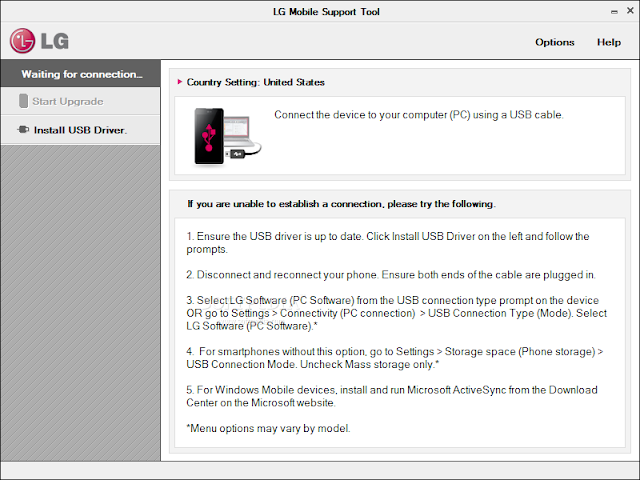 LG Mobile Support Tool is very important for automatic updates detection for LG Mobile devices, you may need to connect the phone to your computer via a USB cable. With this great application, updating the Firmware became very easy and not complicated, as the tool upgrades the Firmware itself. Once the update is complete, the tool will make a sound. Software Name: LG Mobile Support Tool Free Download. OS Requirement: Win XP, Vista, 7, 8 and 10. Click on the button below in order to download LG Mobile Support Tool for PC. It's a complete offline installer and standalone setup for LG Mobile Support Tool. This file would be compatible with both 32 and 64-bit windows. SoftCroco © 2019. All Rights Reserved. SoftCroco is a review-site of third-party software. All trademarks, registered trademarks, product names and company names or logos mentioned herein are the property of their respective owners.